Sometimes solo shows do something unique. The author writes a story that is not their life story. They craft a play inspired by vital themes but generate a new character to tell the tale. Such is the case in Adin Lenahan’s Pilgrim Notes. Playing an array of Louisiana-tongued personas, Pilgrim Notes is the intimate tale of a young man’s correspondence with a convicted serial killer and the bond the pair find. 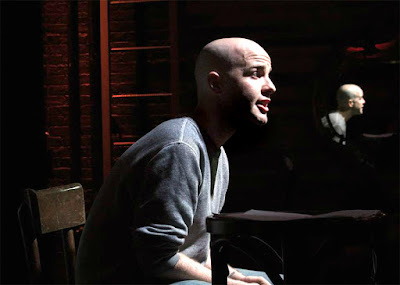 With specificity from start to finish, Pilgrim Notes, written and performed by Adin Lenahan, chronicles the personal story of a young gay man who’s life is shattered through the indirect murder of a former love at the hands of a cannibalistic serial killer. On a search for identity, Jasper Lange finds himself in communication with the infamous Brando Gierke. With personal relations and media views altering his perceptions, Jasper must decide whether this newfound connection is meaningful or just something he desperately desires to be real. When it comes to crafting an intriguing plot, Lenahan has done a wondrous job. He gives each important player a brief introduction that sticks with you until they’re worked in. The complexity of storytelling allowed the pieces to fit nicely into one another like a puzzle. Just when you asked yourself what something happened to do with the overall tale, Lenahan was there to answer it. That being said, the momentum is high to start and it's fantastic but once the story gets heated, something weakens, allowing the air out. It's almost as if stamina is a factor, both contextually and via performance. Lenahan and director Caroline Kittredge Faustine allow little time between character beats to inhale and take in the information. Once you got used to the pace, it was fine. But the fact that Lenahan could morph seamlessly from character to character defines the talent of Lenahan. He is the epitome of the character actor. No matter the age or gender, he found them. Due to the regionality of the story, Lenahan didn’t have a dialect crutch to help him deviate characters. And he didn’t need to because he knew how to find difference through diction and cadence. Adin Lenahan has an inane sense of character and fluidly shifts from person to person without hiccup. Whether it was a choice or simply how the play unfolded, director Caroline Kittredge Faustine kept Lenahan close to the secretary desk in the corner. She didn’t have him travel much. It kept the piece moving but it meant an immense amount of unused dead space between Lenahan and the audience. It’s only a tiny woe from an overall solid production. Pilgrim Notes is one of those rare solo plays that captures the audience’s emotions in a hypnotizing way. Planet Connections is likely not the last time you’ll see Adin Lenahan or Pilgrim Notes.